For current fans of westerns, the obvious star of this western musical comedy would be the young Canadian actor Glenn Ford. But at the time this was made in 1941, he was not the biggest star; first billing went to Penny Singleton, then known for having appeared as Blondie in a series of slight films based on the Dagwood and Blondie comic strips. (She and Arthur Lake would make 28 of them between 1938 and 1950, including one with Glenn Ford in 1940; many were directed by Frank Strayer.) Here, she is Belinda “Bill” Pendergast, the young lady of the title. The once-tomboyish Bill is headed west to join her uncle Joe Pendergast (Charles Ruggles) in the lawless town of Headstone, now terrorized by the outlaw gang of Killer Pete. In the stage with her is Tex Miller (Glenn Ford), a federal marshal being sent as temporary sheriff to clean things up in Headstone. 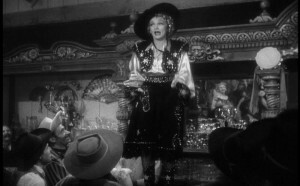 When the stage is attacked by Indians, Tex is surprised to find Bill outshooting him in the stage’s defense (like Mae West in the previous year’s My Little Chickadee). Uncle Joe owns the Crystal Palace saloon, where the principal entertainment (and most of the movie’s musical numbers, along with some anachronistic but well-executed tap dancing) are provided by Lola (Ann Miller). He is shocked to find that Bill Pendergast is a young woman. Unfortunately, Lola and Bill do not get along well. 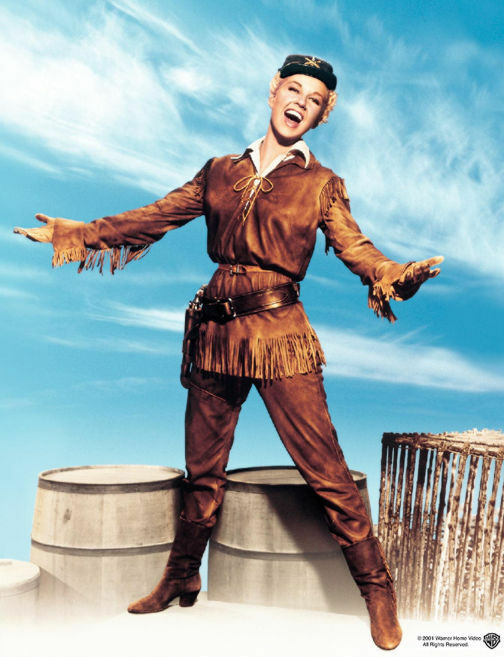 Young Belinda “Bill” Pendergast (Penny Singleton) is surprisingly adept with a gun. 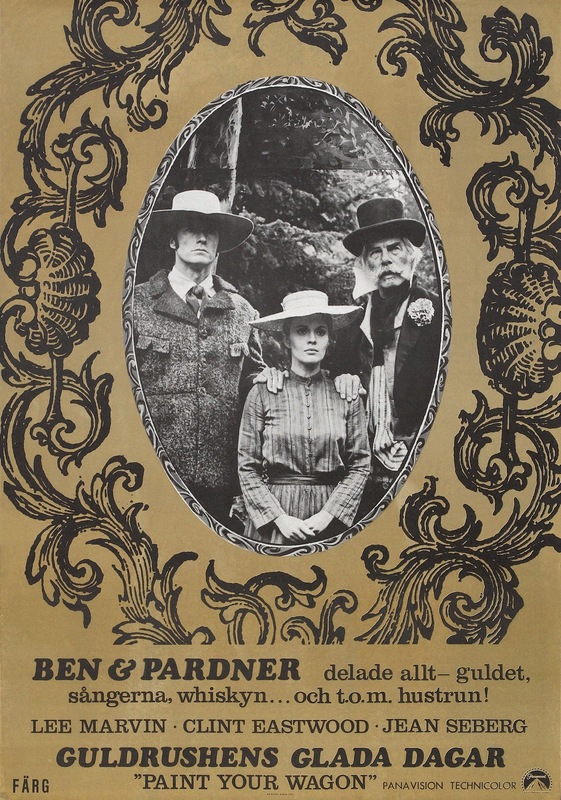 Uncle Joe owes more and more of his saloon to his financial backer, Hannegan (Onslow Stevens), but both of them seem to be losing money to Killer Pete. [Spoilers follow.] Unknown to almost everyone, however, Hannegan is in fact Killer Pete. Tex does his best to bring a little law and order. As Tex keeps fighting with bad guys who are bigger than he, in a running gag Bill tries to help him but always ends up bashing Tex. He warns her off (to no effect) in one fight. “Don’t hit him! It’ll be me!” It always is. Bill (Penny Singleton) and Lola (Ann Miller) don’t get along. Eventually physical hostilities erupt. Elements of this are reminiscent of Destry Rides Again, from two years earlier, with the corrupt town, the diffident-seeming (but actually forceful in his way) young lawman, and the exuberant fight between two women (Marlene Dietrich and Una Merkel in Destry, Singleton and Miller here). Other than those references, the writing here is desultory and the comedy predictable, with pies in faces, law and order prevailing against Killer Pete, and the young lovers getting together after multiple misunderstandings. 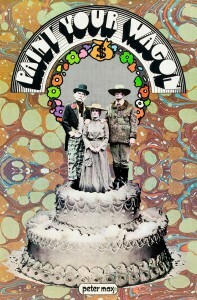 Like Belle of the Yukon, this is edging more into musical comedy than western. Along with all the other musical numbers (several written by Sammy Cahn and Saul Chaplin), one is provided by Bob Wills and his Texas Playboys. After numerous altercations, misdirected punches and the occasional pie in the face, finally the young lovers (Penny Singleton and Glenn Ford) get together. 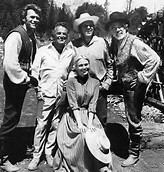 Shot in black and white at the Iverson ranch in Chatsworth, California, at only 70 minutes. Not available on DVD in the U.S. Not to be confused with Go West, Young Girl, a 1975 made-for-television movie with Karen Valentine. 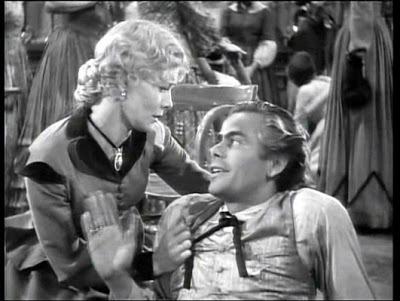 Or with the better-known Go West, Young Man, 1936, with Mae West, Warren William and Randolph Scott. This entry was posted in More Westerns and tagged Glenn Ford, Western Comedies, Western Musicals on November 5, 2015 by Nicholas Chennault. 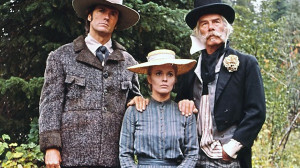 Or are they western musicals? The two movie genres of musicals and westerns make for an uneasy mix (see, for example, the ballet sequence in Oklahoma! ), but it has been done several times. 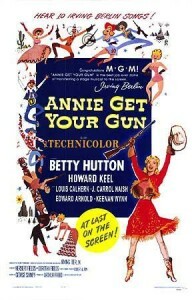 It appears to have been most successful in the early 1950s, when Howard Keel was the king of the mixture, partnering with Betty Hutton (Annie Get Your Gun), Doris Day (Calamity Jane) and Jane Powell (Seven Brides for Seven Brothers). Some of the biggest names in the American musical theater, such as Rodgers and Hammerstein and Lerner and Leowe, tried their hand at these. 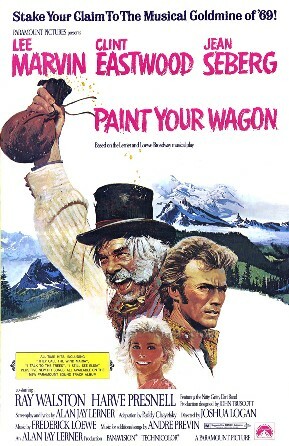 Finally, as big musicals were fading from cinematic favor in the late 1960s, one of the last of them was Paint Your Wagon. 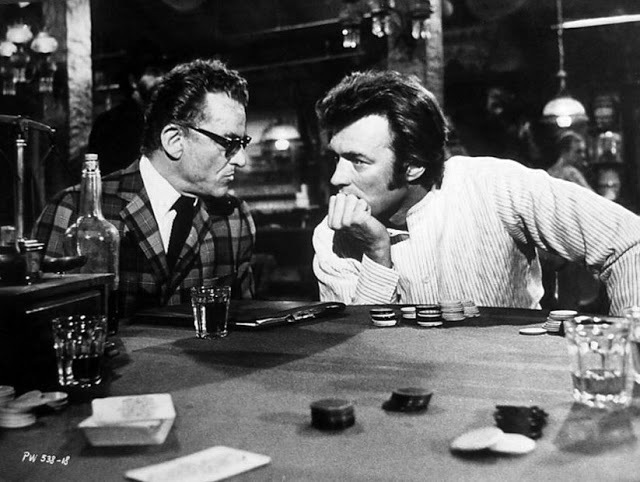 For hard-core fans of westerns, these are not usually the sort of thing they like, even if they do star Clint Eastwood and Lee Marvin. 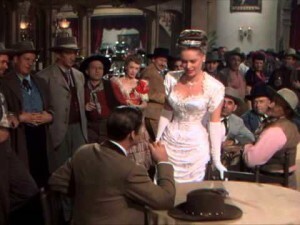 Some westerns have a significant musical number, usually provided by a dance hall performer, like “See What the Boys in the Back Room Will Have” sung by Marlene Dietrich in Destry Rides Again (1939) or “Some Sunday Morning” sung by Alexis Smith in San Antonio (1945). But they don’t have enough of them to qualify as musicals. Howard Hawks liked to throw in an occasional musical number as an indication of male bonding, as he did with the duet featuring Dean Martin and Ricky Nelson in Rio Bravo. But musicals weren’t really his genre, although he had an unusually wide range as a director. Girl of the Golden West (1938). Nelson Eddy is an improbable Mexican bandit and Jeannette Macdonald his romantic interest in old California. 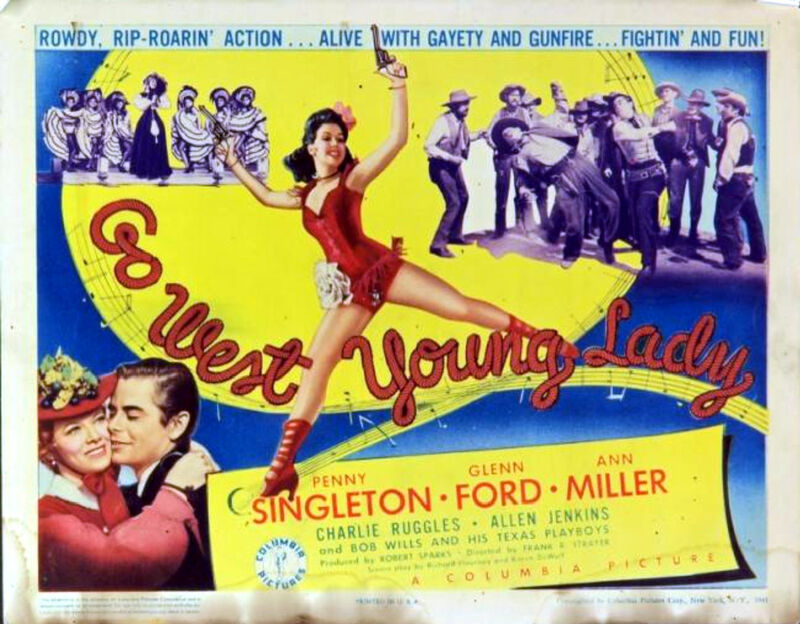 Go West, Young Lady (1941). 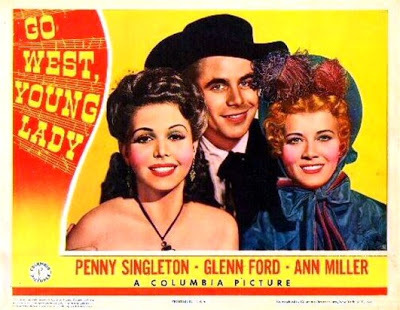 This comedy/musical follows the new sheriff (Glenn Ford) in Headstone, as he romances the niece (Penny Singleton) of the owner of the Crystal Palace saloon. Ann Miller sings and dances as the principal entertainer at the saloon. And Bob Wills and his Texas Playboys show up as well. Some of the songs are by Sammy Cahn and Saul Chaplin. Belle of the Yukon (1944). Set in the gold-rush Yukon in northwestern Canada at the turn of the last century, most of the music is provided by a young and dark-haired Dinah Shore as a dance hall entertainer. The main action is provided by stars Randolph Scott and Gypsy Rose Lee. The Harvey Girls (1946). Not much of a western, but it is set in the southwest as the railroads extended into that part of the country. And what list of musicals would be complete without Judy Garland somewhere on it? Two Guys from Texas (1948). Two vaudevillians (Dennis Morgan and Jack Carson) on the run from crooks try to pass themselves off as cowboys. With Dorothy Malone. Annie Get Your Gun (1950). Judy Garland was originally slated to star in this, but her star was just beginning to fade at MGM and the role of Annie Oakley went to Betty Hutton in the film. 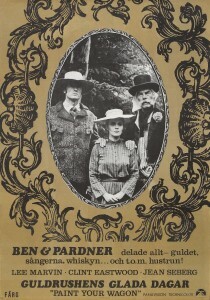 She and Howard Keel as Frank Butler cavort their way through Buffalo Bill’s Wild West show. 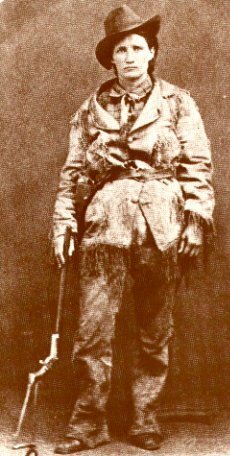 Calamity Jane: Which is the real one? 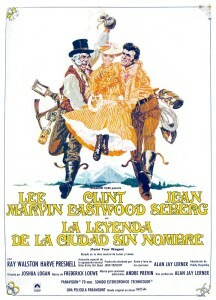 Calamity Jane (1953). 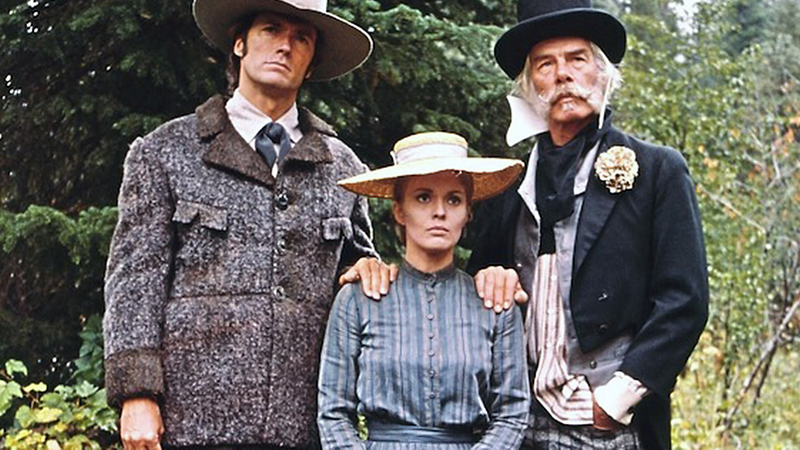 In appearance, it would be hard to get farther from the actual Martha Jane Canary of Deadwood, Dakota Territory, than Doris Day. And Howard Keel doesn’t look or act much like Wild Bill Hickok, either, but in 1953 you couldn’t make a musical movie based in the west without him. 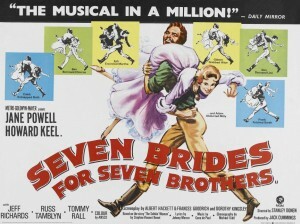 Seven Brides for Seven Brothers (1954). 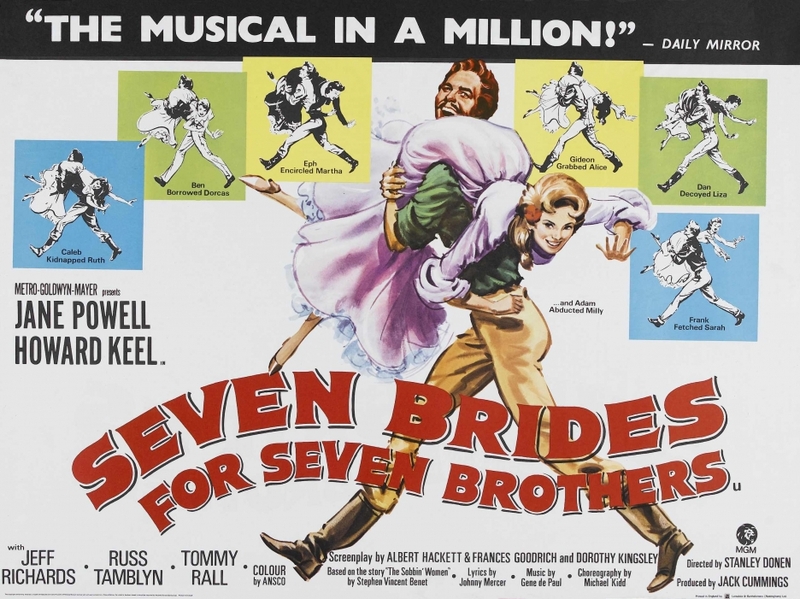 Set in Oregon in 1850, this is one of the biggest hits of Howard Keel’s career, as he plays Adam, the oldest of the seven brothers, who marries Jane Powell and inspires his six brothers to abduct their own intended brides. Oklahoma! (1955). 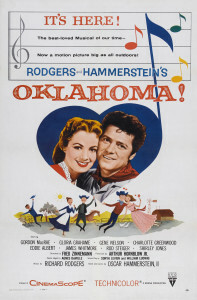 One of the first of the string of successful Rodgers and Hammerstein musicals on Broadway, this took its time making it to film with Gordon McCrae and Shirley Jones. Paint Your Wagon (1969). 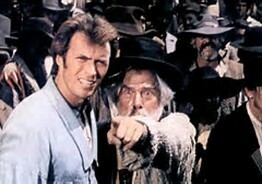 Set in gold rush northern California of 1850, Lee Marvin and Clint Eastwood demonstrate that while they rank among the best actors in westerns, they’re not entirely comfortable in a musical, especially when they have to sing. This entry was posted in Lists and tagged Western Musicals on February 19, 2015 by Nicholas Chennault.